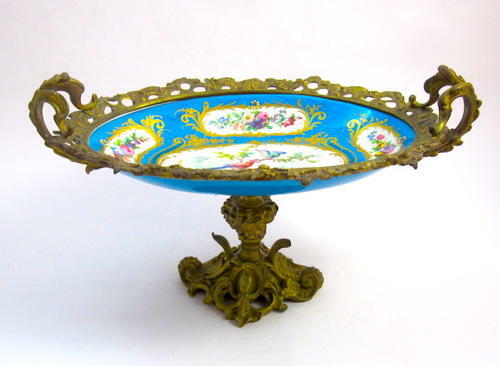 An Oval Sevres Bleu Celeste Porcelain Centrepiece Embellished with a Large Central Medallion Featuring Two Colourful Birds Nesting on a Branch. The Medallion is Framed by Foliage Painted with Gold and a Small Pearl Ring. The Central Medallion is Framed by 4 Medallions each Decorated with Bouquets of Multicoloured Flowers on a White Background and Framed by Gold Enamel Foliage. All Mounted in Gilt Bronze.